Young girls get ready for their debutante ball or afternoon tea using our beautifully crafted white vanity with mirrors and extra drawer. A classic wooden vanity with gently scalloped silhouettes and adjustable side mirrors provides a timeless look for any bedroom or playroom. 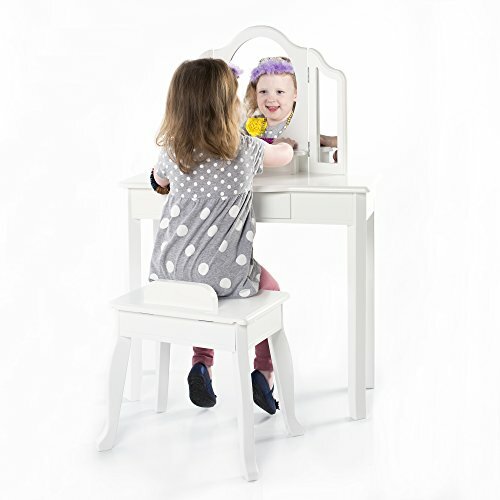 Girls will feel elegant and independent playing dress up using a vanity and stool set of their own. Ages 3+. This product is sold by and shipped from the Guidecraft warehouse in Minnesota. Guidecraft is one of the leading brands in children's toys and furniture for the early education and consumer markets. Guidecraft designs systems-based STEM toys, quality furniture, gross motor, social emotional products and brands that combined, create the basis for a unique and robust set of offerings in the US and international markets. Since 1966, Guidecraft's mission has been to create objects of lasting importance that enrich the lives of children and articulate and define creative, joyful, and meaningful experiences. Perfect for ages 3 and up. Stool supports up to 100 lbs.